Operational scenarios may call for the separation of encrypted digital radio packets and secure voice calls sent over IPsec protocols. Using your radio encryption terminals such as KY58 / KY99 / KY100, Orion can help your teams transition from non-secure to highly secure communications with our switch. The Orion red black switch (KYoIP) allows the encryption device to be installed in a security zone isolated from the radio equipment. 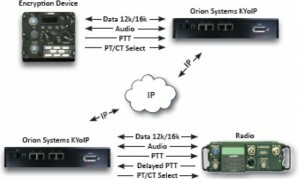 The RoIP encryption transceiver may be in an area that is difficult to secure or where security policies require a permanent physical presence. The secure VoIP console we call the KYoIP device provides the solution for extending COMSEC devices over an IP network and transports both wide-band (encrypted) and narrowband (audio) information. 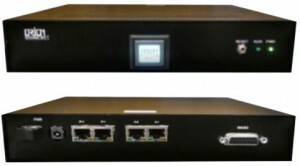 These dispatch consoles can be configured to send encrypted VoIP calls to radio over IP networks, connecting secure mobile communication devices with ease. Our full featured operator consoles can be customized to fit many different applications. Perhaps you have a fleet of small ships and you wish to connect VHF radios with Voice over IP for improved ship to shore communications…we can do that. Our IP radio system can even interconnect HF radios being used in remote long range operations if there is a Wide Area Network we can tap into. Unlike a typical PBX Console used in commercial applications, our IP Radio Consoles are programed for your specific application while the hardware is comprised of typical PC’s, Tablets, and Laptops which we acquire through our partners. Options like being sunlight readable, durability for wide temperature ranges and rugged environment are available upon request. If you prefer using your own preferred hardware brands, no problem. We will work with your supplied equipment. The KYoIP device is available in either a standalone 19” wide 1 rack unit device or can be ordered as a plug-in module & chassis. The plug-in module & chassis version allows for high density packaging. A single 19” wide 1 rack unit chassis can accept 4 plug-in modules.